Kingman, Ind. 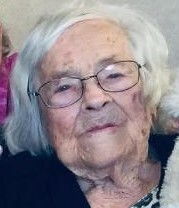 - Martha E. Staggs, 99, of Kingman passed away at 12:45 a.m. EDT Saturday, April 13, 2019 at the Waters of Covington in Covington, Indiana. She was born October 8, 1919 in Stringtown, Indiana the daughter of the late Ben and Mary (Snoddy) Merryman. Martha married Ray H. Staggs on February 19, 1950 in Cates, Indiana. He preceded her in death on March 2, 2015. Survivors include her son: James Ray (Becky) Staggs of rural Kingman, Indiana; Brother: Harold Leon (Peggy) Merryman of Veedersburg, Indiana and several nieces and nephews. Martha was preceded in death by her two brothers: Leroy and Rudolph Merryman. Martha was a member of the Kingman American Legion Auxiliary Unit 384 and the Covington V.F.W. Auxiliary #2395. She was a 1937 graduate of Kingman High School. Martha formerly did volunteer work at the V.A. Hospital in Danville, Illinois. She enjoyed going to flea markets and crocheting. Funeral services: 12:30 p.m. EDT Wednesday, April 17, 2019 at DeVerter Funeral Home in Cayuga, Indiana; Officiating: Pastor Gary Johnson; Burial: Danville National Cemetery in Danville, Illinois; Visitation: 10:30 a.m. EDT Wednesday, April 17, 2019 until time of services at the funeral home. Contributions may be made to the Kingman American Legion Auxiliary Unit 384, 251 West State Street, Kingman, Indiana 47952.